Like many parents, I have daydreams about all of the things that I would like to be able to do for (and with) my kids. On a grand scale, I'd love to travel the world with them. Every time Big Sister E asks about a distant country or city, instead of pulling up a map or pointing at the computer screen, we'd hop on our private jet and go visit for ourselves. Somehow that whole image seems in stark contrast to what actually happens around here and the way that I stumble down the stairs looking for coffee typically long after my kids are already munching on a bowl of cereal. But the dream of whipping up a delicious breakfast (minus the actual cooking, cleaning and amount of time that it all takes) is still there, so that counts for something, right? What's a kid have to do for some breakfast around here?? 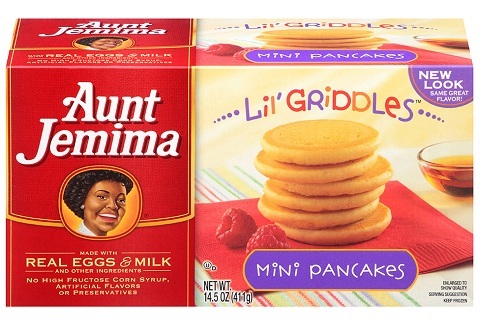 Fortunately, Aunt Jemima has recently come to my rescue with their new, delicious and quick Lil' Griddles. 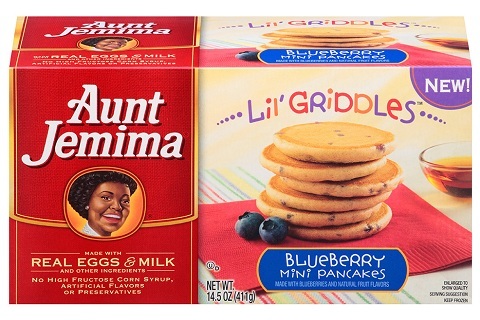 Giving families the ability to have big breakfast taste in perfect bite-sized doses that kids love, the new Aunt Jemima frozen breakfast Lil' Griddles line is where "every batch is made from scratch" and makes it easy. After all, Aunt Jemima frozen breakfast puts love and care into every step – from stirring the batter and pouring it on a hot griddle to flipping the fluffy and bubbling pancakes, just like all of us do. In fact, they take great pride in making frozen pancakes, waffles and French toast just like moms across America make breakfast in their own kitchens – their griddles just happen to be a little bit bigger. Make my dream into a reality with no messy batter, no piles of dishes in the sink afterwards, and no need to get up 30 minutes earlier? 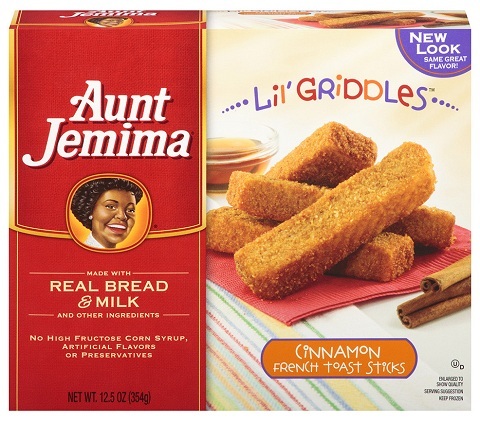 That's pretty much all the convincing that I need to know that the three delicious bite-sized options for family fun — new Aunt Jemima frozen Blueberry Mini pancakes, Aunt Jemima frozen Mini pancakes, and Aunt Jemima frozen mini Cinnamon French Toast Sticks — would be a hit around here! I love the idea that these could be pulled out of the freezer any day of the week, popped into the microwave, and ready to fill my kids up before heading off to school. We all know that breakfast is the most important meal of the day, so my laziness should be no excuse for sending my girls off without full stomachs! Even better, I appreciate that Aunt Jemima has taken their "every batch made from scratch" and truly extended it to these products – including real ingredients such as eggs, milk and sugar. These Lil' Griddles really would allow me to serve my family a breakfast just like I had made it... except minus all of the work. The goal of Aunt Jemima frozen breakfast is to deliver every batch just like you'd make it yourself and, with their new Lil' Griddles options, you can start your family out with a warm, kid-friendly breakfast that can make the whole day more special. No matter if you are an early riser or like to hit snooze, the overall convenience, taste and love for the new Lil' Griddles from Aunt Jemima frozen breakfast will have you (and your kids) smiling to get out of bed in the morning. Keep an eye out for these the next time you are at your local grocery store and find out more by visiting AuntJemima.com and connecting with them on Facebook and Twitter. We buy these for my granddaughter's breakfast and she loves them. Great product, wonderful review. 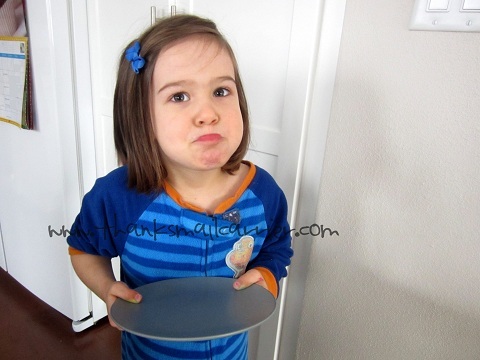 How did you get your daughter to make such a sad face for the picture? I'd like the mini blueberry pancakes for myself. i love this new "little" addition! I love the McDonald's McGriddles. These definitely have to be cheaper and more convenient than those. It's so important for kids (and adults!) to have breakfast, so it's great that Aunt Jemima Lil' Griddles are easy to prepare and serve. The pancakes and french toast sticks also look like a convenient size for kids to hold and eat quickly so that's also great as mornings can always be rushed.